Cookistry: Make Ahead Bread ... The Good Cook blogger event! You might have noticed that I took a few days off from blogging in the last couple weeks. That's because the second half of my book was due to the publisher on February 1, and I was busy finishing a lot of little things. Now that it's turned in, I can take a few deep breaths and get back to cooking, blogging, writing, and baking. 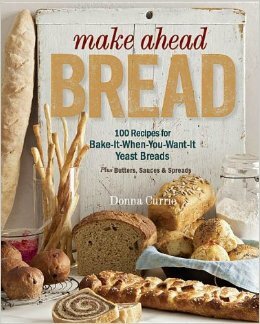 But meanwhile, my book, Make Ahead Bread is already up for sale on Amazon. SQUeeeeeee! Okay, now that I've got that out of my system, it's time to get back to work, I guess. But first, I have a little something for you. Or, more accurately, my good friends at Good Cook have a deal for you. If you pre-order my book on Amazon before Feb 28, Good Cook will send you a free loaf pan. Just like that. No winning or raffling or choosing. Just pre-order, fill out this form, and a loaf pan will get sent to you from Good Cook. To get the pan, fill out the form HERE. The theme of Make Ahead Bread is breaking the bread-baking process into several steps so that you can fit the prep work and baking into your schedule. For most of the recipes, on the day you want to bake, you just preheat the oven and bake. There are also recipes for sauces, compound butters, and some fun recipes for using left over bread. Many of the recipes are very simple, so even new bakers should get a good result. The following recipe was published previously on this blog, and you might say it's a precursor to the methods used in the book. It's not quite the same, but it's still a recipe that's designed to be easy, even for non-bakers. Add the sugar and yeast to the water in your measuring cup and stir to combine. If you're using anything except an instant yeast, let it sit for 5-10 minutes, or until the mixture is lively and bubbly. If it's instant yeast, you can continue without proofing, or let it proof to ease your mind that the yeast is alive - your choice. Put the flour and salt into a medium bowl, and stir to distribute salt. Add the water/yeast mixture to the the bowl with the flour, and stir to combine all the ingredients. Sprinkle some flour on your countertop and dump the dough mixture onto the counter. Knead for a minute or two, adding flour as necessary to keep it from sticking. You don't need to knead until the dough is stretchy and elastic - just knead until it's a nice cohesive mixture and not a lumpy, sticky, blobby mess. Form it into a ball. The next day, take the bag out of the fridge and massage it a bit, still in the bag, to mash out all the bubbles in the dough. You may need to open the bag to let the air out, but reseal it after. Leave the bag on the countertop until the dough has come to room temperature, about an hour. It will rise and expand a bit during that time. Preheat the oven to 350 degrees. Sprinkle some cornmeal on the bottom of a loaf pan. Sprinkle some flour on your countertop, and dump the dough onto the counter. You don't need to squeeze every bit of olive oil out of the bag, but don't try to hold it back, either. Knead and fold it a bit to incorporate the olive oil into the dough, then form the dough into a log that will fit into your loaf pan. Put the loaf into the pan, cover the pan with plastic wrap, and let it rise until it has at least doubled in size. I used an 8 1/2 x 4 1/2 pan and let it rise until it was slightly higher than the pan. Remove the plastic wrap and slash the top. 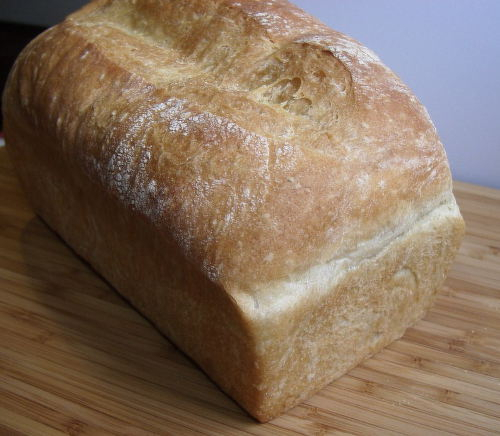 Bake at 350 degrees for 35-40 minutes, until the bread is golden brown and the loaf sounds hollow when tapped. Let it rest in the pan for about 5 minutes, then place it on a rack to cool completely before slicing. And now for a blogger event! You probably have noticed that I've gone quite a number of posts featuring Good Cook products. Now, they're featuring ME in a blogger event. A bunch of the Good Cook Kitchen Experts will be making some of my recipes, blogging about it, and telling their readers about the loaf pan offer. Check out the linky below for their awesome bread creations! Thanks to Good Cook for all the awesome support, and for putting together the first blogger event featuring my book. And here's a link to an article on the Good Cook site featuring my book. Awesome, right? And thanks to everyone who pre-ordered the book! If you ordered before the free loaf pans were offered, you can fill out the form and get your loaf pan. Isn't that awesome? You can get 25% off your order at Good Cook with the promo code BAKEBREAD. I suggest you go buy some loaf pans. Just because.